This new and digitally recorded live performance has been adapted and updated from the 1977 double album from Free Reed Records FRRD 023/034, with it?s later CD versions. It originally featured such notables as Peter Bellamy, Robin Dransfield, Roy Harris, William Rushton, Pam Gilder and the inspiration behind it all, Vic Gammon. We tread humbly and lightly in their footsteps. The groups new live show was originally conceived and rehearsed as a one-off, to be performed at Stainsby Festival, Chesterfield, Derbyshire in July 2014 in celebration of a number of years of the festival?s volunteer-run famed Real Ale bar ?The Hat Block?. This was so well received that we were encouraged to bring the show to a wider audience and so with some further work, and an exciting offer by Neil Wayne of Free Reed, who produced the original Double LP 37 years ago, to commit it to CD in the early summer of 2015, we are open for business! Even now, we have bookings with some of the major Folk Festivals in the UK for 2015, and are also developing a USA East Coast tour for 2016! 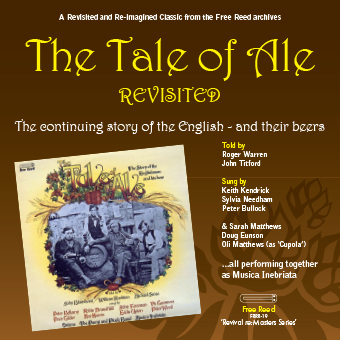 The Tale of Ale has thus evolved into a live performance by a superb group of musicians, together with the two fine readers, creating a professional reproduction, both of the original material and a wealth of new songs and readings. So, who are these paragons of virtue? The music is performed by a combination of Keith Kendrick & Sylvia Needham, by Cupola (Sarah Matthews, Doug Eunson & Oli Matthews) and by Peter Bullock, who in honour of the original 1977 performers, wish to be known collectively as MUSICA INEBRIATA. All of these people enjoy formidable reputations in the national and international folk scenes. The readings are performed by lifelong folkies and erstwhile performers Roger Warren & John Titford. If you like what you read and want to know more about concerts, festivals and bookings, then contact Keith Kendrick and watch out for our video clip which has appeared on YouTube.